A cat and dog can sometimes be best friends and are in this chapter book. Digby and Percy are headed off on for a seaside vacation in a posh hotel in this installment of the series. On their way to the hotel dining room the first night, they were surprised by the arrival of a famous movie star with all her entourage and many reporters and photographers. Later in the evening they noticed a man swept off the jetty and into the sea. Working mightily together, they managed to rescue him from the sea. 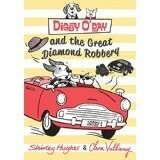 After the famous star has her diamond necklace stolen, Digby and Percy manage to find it along with many other stolen gems. They saved the day and became heroes. The chapters are short, the font large and the pages thick. Many grade two readers and grade three readers will read this independently. There are some unusually large words included for this age group, but literacy decoding skills and context clues should make the story manageable. The sketches will also help by providing picture clues. As a series for emerging readers, this offers a fun start. Teachers and librarians will know which students will benefit from being recommended to try this series.